Why should diabetics usually be effective in avoiding amputation? Because–they usually have good circulation. Yes – some diabetics have very bad circulation and may require surgery for their arteries and sometimes need amputation–however, very bad circulation occurs in the diabetic foot far less frequently than you might think. The most common foot complication in diabetics is a pressure ulcer on the bottom of the foot. It can be on the bottom of the tip of a small toe, it can be under the big toe, it can be under the ball of the foot and sometimes in the arch. Most diabetic ulcers are due to a full or partial loss of feeling in the foot, a condition called peripheral neuropathy. Usually inflammation develops under a bony prominence on the plantar side (sole) of the foot. Normally the inflammation would hurt and a person would reduce the pressure of walking by shifting their weight or changing shoes to avoid the subtle development of pain from the inflammation. Since the diabetic with peripheral neuropathy cannot feel the pain adequately to make adjustments, they continue the repetitive stress on the inflamed tissue until the skin breaks down and an ulcer forms. In most cases the ulcer is not due to a loss of circulation. Most diabetic pressure ulcers will heal without amputation. Sometimes if the ulcer penetrates deeply and the adjacent joint becomes infected, surgery will be required, but not usually amputation. Short leg casts and/or special shoes may be used to reduce pressure and allow healing. Orthopaedic foot and ankle specialists (aofas website link) or podiatrists experienced in diabetic foot care should be consulted when a diabetic person develops a pressure “sore” on the bottom of their foot. When care is delayed, a deep infection often occurs. This 80 year old man with severe diabetic neuropathy had very good circulation with excellent pulses in his feet. He had a deformity of his right foot due to the neuropathy. Two ulcers on the bottom of the foot had been present for over 1 year. With the use of a “diabetic cast,” the ulcers closed in 3 months. No topical ointments where required. Special shoes will be prescribed to prevent recurrence. Most diabetic ulcers are due to the loss of sensation and the ability to feel normally–not because of poor circulation. 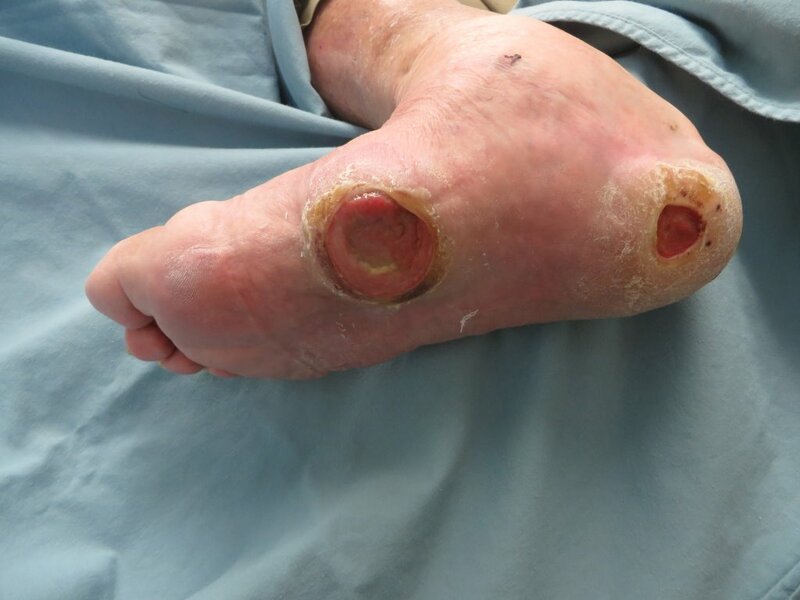 Most diabetics with foot ulcers can heal their infection without amputation if they have proper and timely care.